Each winter, Colorado’s high country opens up once again to snowmobilers buzzing across trails and fields of powder in the crisp, dry, winter air. Everything from family-friendly jaunts to high-speed adventures are available in Colorado’s snowy spots, where going "sledding" makes a great day off the ski slopes or an excursion all its own. Here are 11 recommended places to get your Colorado snowmobiling vroom on this winter. Steamboat Springs snowmobiling is characterized by incredibly expansive, rideable terrain. East of town, Rabbit Ears Pass makes a great place to start. More riding is available in the deep pine country adjacent to the Flat Tops Wilderness Area southwest of Steamboat. To the northwest, good snow in deep winter means sledders can really open it up as miles of virtually treeless terrain rolls toward the city of Craig and beyond. Possible perks to Breckenridge snowmobiling include unparalleled views from the Continental Divide and well-groomed trails in the White River National Forest. One popular groomed area to ride is Georgia Pass Road, which is closed to all vehicular traffic except snowmobiles from late November to late May. The pass’ 11,585-foot summit offers lovely panoramas of Breckenridge, Keystone and Copper Mountain. The well-groomed, 120-mile Sunlight to Powderhorn trail is a virtually endless playground for snowmobiliers of all abilities. There are multiple access points starting in Glenwood Springs and reaching all the way to Powderhorn ski resort near Grand Junction, and countless snowmobile-friendly lodges (like the Grand Mesa Lodge) and guide services along the way. Ride the groomers on any of an additional 180 miles of associated trails or burst into high-gear in any of the powdery meadows and hillsides that make this expansive area a Colorado favorite. The grounds of Routt and Arapaho National Forests supply 300 miles of snowmobiling trails near the town of Kremmling, a two-hour drive from Denver. Famed Rabbit Ears Pass is just 45-minute away, while Spring Creek is a less-crowded haven for riders to explore sweeping fields nestled between Silverthorne and Kremmling. Share and share alike — that’s the amiable concept at work in the Vail Pass Winter Recreation Area, a massively popular snowmobiling and backcountry ski area just east of Vail Mountain and right off I-70 (read: easy access). Like the ski slopes nearby, the WRA’s terrain is world renowned, so skiers and snowmobilers have come up with a system for sharing the trails that gives everyone lots of room for fun in some of Colorado’s most spectacular terrain. Known for great snow accumulation and soft powder, Kebler Pass is a prime area for snowmobilers in the Gunnison and Crested Butte area. Other groomed powder fields include Ohio Pass Road, Splains Gulch and Lost Lakes. Journey with caution: Many cross-country skiers and snowmobilers also use the trails. On average, more powder falls in this area than anywhere else in Colorado, and the trail system reaches deep into the wild and rugged San Juan Mountains. That’s why guides are highly recommended for newcomers of any snowmobiling ability, who will revel in this complex and well-cared for trail system that accesses Black Head Peak, Eagle Mountain and Wolf Creek Pass near Pagosa Springs. Grand Lake’s streets become snowy rights of way for snowmobilers as long as there’s snow on the ground, making it easy to get on the trails — and back into town for snacks in between runs. Continental Divide views abound on the 300 miles of trails near town in the Arapaho National Forest along the western border of Rocky Mountain National Park. Meeker is the gateway to nearly 180 miles of groomed and ungroomed trails that challenge even the best riders headed to Trappers Lake, the Flat Tops and Ripple Creek Pass along rolling hills and open meadows maintained by the White River Snowmobile Club. Propel your motorized chariot through heaps of fluffy powder in South Fork, home to 255 miles of groomed trails woven amid wide-open ridges, sprawling meadows and steep climbs. There are also plenty of opportunities to soak in some of Colorado’s most scenic 12,000-foot vistas, and ungroomed detours are abundant for those who fancy blazing their own trails. 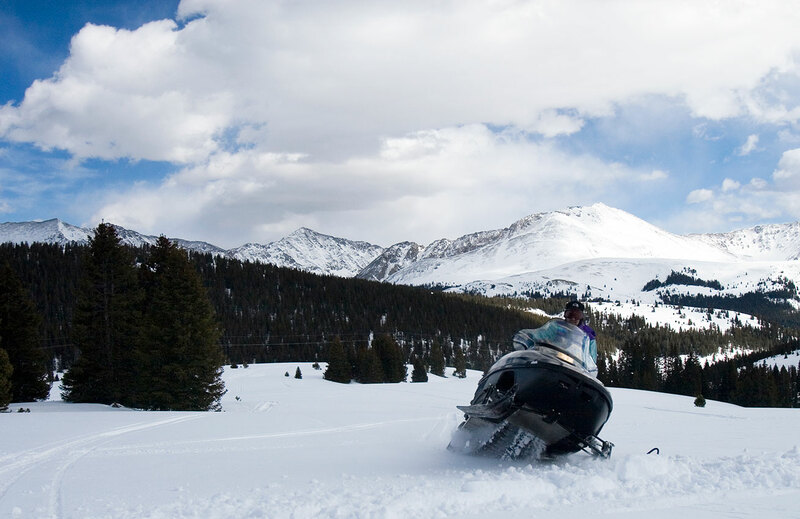 The area between Creede and Lake City encompasses more than 200 miles of groomed snowmobiling trails in the Gunnison and Rio Grande national forests. Elevations range between 8,500 and 13,000 feet, and off-trail options offer access to wide-open ridges, rolling hills and steep ascents. Free maps are available from the Silver Thread Outdoor Club, who warmly welcome visitors on their group rides. Lake County has more than 50 miles of trails groomed by the High Riders Snowmobile Club, a group based out of Leadville — the state’s highest incorporated city at 10,152 feet — and oodles of ungroomed open space for those seeking backcountry action. A substantial chunk of the groomed trails travel through the East Side Mining District, making it possible to visit historic gold rush sites via snowmobile in the winter (or 4x4 vehicle in the summer). Colorado Adventure Park near Winter Park Resort has Snow Scoots (mini snowmobiles) for young speed seekers. Kids 6 to 13 years old can practice for pro terrain on a groomed track within the park’s boundaries. Colorado snowmobile rental outfitters can set you up with gear, guides and great tips for the best places to explore deep backcountry trails. For even more information, check out the Colorado Snowmobile Association. Check out our Colorado Outdoor Adventure Blog for more inspiration.